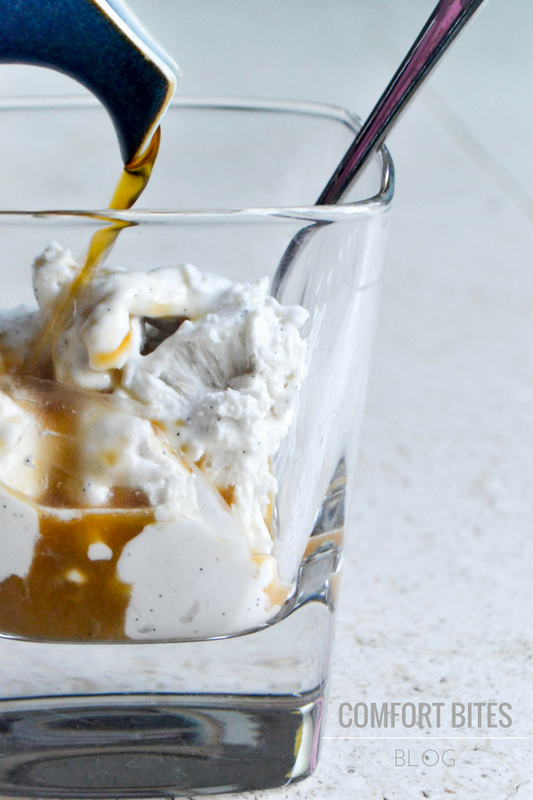 An AIP compliant version of the classic Italian Affogato dessert. 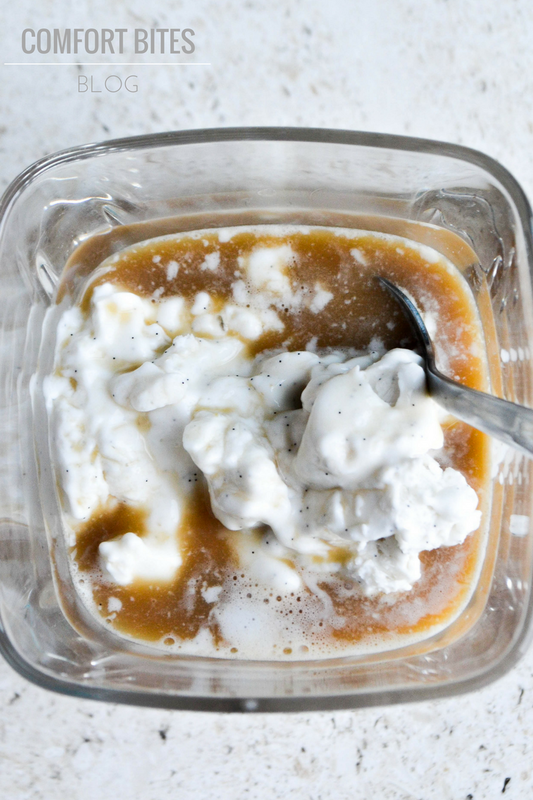 A shot of caffeine-free chicory coffee, poured hot over vanilla coconut cream ice cream. Gorgeous. This post contains some affiliate links. This means that if you decide to make a purchase, I might receive a small commission that goes back into helping me keep the blog going. Thank you for your support. That hot, strong black espresso coffee poured over ice cold vanilla ice cream. The hot dark coffee would mingle with the ice cream and melt it away in ribbons. The contrast of the hot coffee and the ice cold ice cream was beautiful. A treat. I don't drink coffee any more, since I discovered it lay at the root of a lot of my digestive problems, and probably my anxiety, too. Dairy and sugar (aka ice cream) doesn't do me any favours either, and can trigger my IBS. Remembering back to the Affogato pudding, I wondered how it would be if I subbed in coconut cream for the ice cream and my beloved chicory coffee for the espresso. If you make the coconut cream ice cream earlier in the day, so you can have this for dessert in the evening after dinner, the actual pud will take you about 2 minutes to put together. Just remember to leave the ice cream out at room temperature so it's scoopable. In an emergency - which is the right word to use - I've given the tub of frosty, speckled cream a quick blitz in the microwave for a few seconds to soften it. You'll notice as well, that I've used real vanilla seeds in the ice cream. While seeds are generally eliminated on the autoimmune protocol, it's thought that vanilla seeds are too small to chew and aren't digested. However, go with what you usually do with this and feel free to substitute vanilla powder or alcohol free vanilla extract. I hope you love it. I totally do. To make the ice cream, pour out any of the watery liquid from the coconut cream and discard (you can add this to your next smoothie). Whip the coconut cream in a bowl until it's slightly stiffened and airy. Trickle in the runny honey and add the vanilla seeds. Fold in gently. 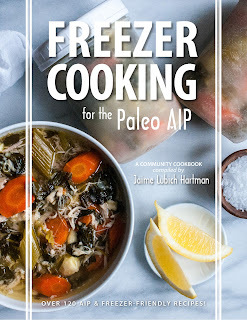 Scrape into a freezable container, add the lid and freeze for about 4-5 hours, or until frozen. Once the ice cream is frozen, take it out and allow to sit for a while at room temperature - keep an eye on it, so it's just scoopable. Fill the kettle and put it on to boil. Put 1 teaspoon chicory coffee (I use Prewett's) in a mug and top with the hot water. Stir. Scoop the vanilla ice cream into two serving glasses and then take to the table. Quickly trickle the hot chicory coffee on top of the ice cream, allowing it to melt slightly. Eat straight away.